CDG Patchouli Luxe in the pyramid bottle. Source: Fragrantica. White pepper, fenugreek, bearberry, lovage, oak extract, opoponax [sweet myrrh], patchouli, cedar, vanilla, sandalwood, vetiver. Luxe Patchouli opens on my skin with a burst of white pepper quickly followed by smoked, slightly singed cedar, a boozy, vanilla-infused Bourbon, and more white pepper. 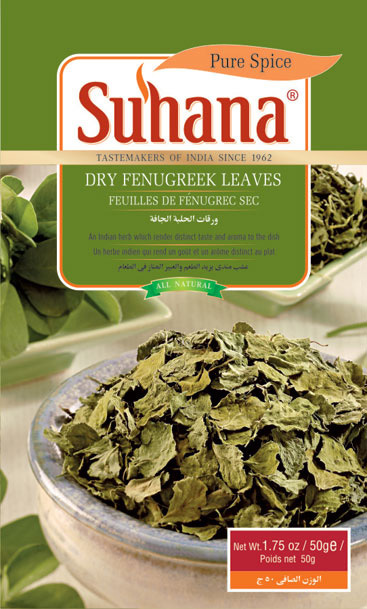 There are hints of dried greens, dried grass, dried herbs, and smoked vetiver. On their heels is black pepper, fenugreek, dill pickle, and something not included on any ingredient lists that I could see: immortelle. Subtle flecks of a leathery darkness pop in and out of the beautiful pepper and herbal top notes. 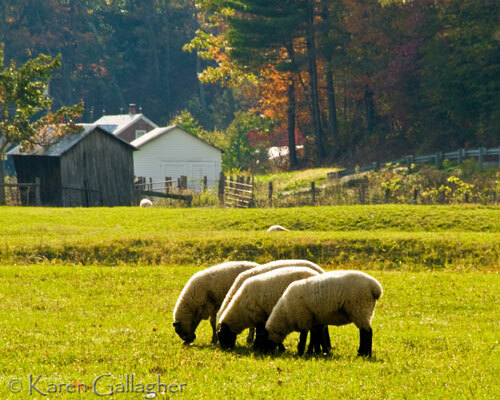 It’s like a vista of dry yellow and green fields dotted with foraging sheep. The field lies at the edge of a dark cedar and vetiver forest that is smoking, so someone decided to douse the sparks and singed tinder with sprinkles of vanillic Bourbon. Less than five minutes in, the immortelle or Helichrysum suddenly springs into action, followed quickly by the fenugreek and a faint touch of mildewed woods. For me, Luxe Patchouli should really be called Luxe Immortelle since the flower seems to have been used by the bucketfuls. 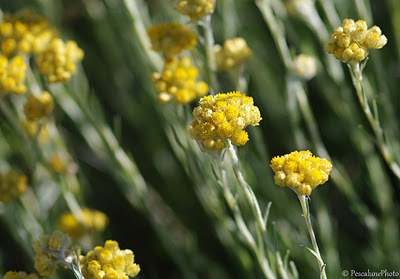 For a large part of the perfume’s development, the aroma reflects immortelle’s drier characteristics: a herbal floralacy that smells like dried chamomile, dandelions flowers, and yellow curry powder. 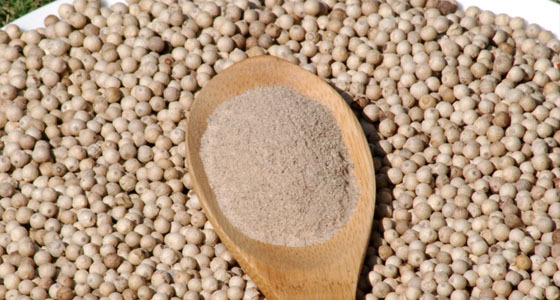 Soon, even more white pepper arrives on the scene, followed by sweet myrrh’s nutty warm smoke, and dry cedar. The pepper is absolutely lovely, as it smells exactly like the really expensive Muntok Indonesian kind you use in cream-based dishes. (Julia Child hated the use of black pepper in white sauces.) The white version isn’t something I’ve encountered frequently in perfumery, so I’m a big fan, though it vanishes in less than 10 minutes on my skin. Baghali Polo. Source: Cooking Minette. In short, I smell of food and dried herbal flowers, with a touch of pickled dill, but there is nary a whiff of patchouli to be found anywhere. Actually, I am reminded distinctly of Serge Lutens‘ Santal de Mysore, which I’m pretty sure also contains a heaping amount of fenugreek and which made me think of the same dish. Luxe Patchouli is not as foodie, sweet, curried, or hotly buttered as the Lutens. It is a much more peppered, dry, woody take on the Lutens’ fenugreek Baghali Polo, but they definitely feel like cousins to me. I wasn’t a fan of the Lutens, and I’m not a fan of CDG’s bouquet either, though I do liked the singed cedar in the background. CDG Luxe Patchouli simply does not change on my skin. 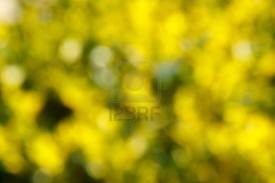 Starting around 15 minutes into its development until its very end, it is primarily an immortelle and fenugreek perfume. There are subtle variations in characteristics of the immortelle, as well as in the prominence of the fenugreek, or the quantity of smoked, dry woods in the background, but, by and large, the fragrance is primarily some form of immortelle on my skin. Patchouli? Not as I know it. Not green, medicinal patchouli, not conventional brown, spicy-sweet patchouli, or even the ghastly modern, fruited purple kind. Patchouli — luxe or otherwise — is simply not a factor in a fragrance whose name pays homage to that one, solitary note. I don’t understand any of it. While I could blame my skin for acting up, I’m not alone in finding Luxe Patchouli to be predominantly an immortelle scent. We will get to that shortly, since I should first give you the rest of the perfume’s development. Luxe Patchouli has some unusual things going on with the sillage. Regardless of quantity, the fragrance hovers right on the skin within 45 minutes. At a larger dose, there are little tendrils that hover in the air around me, and the immortelle is noticeable from afar. As a whole, Luxe Patchouli feels very soft, very quickly. 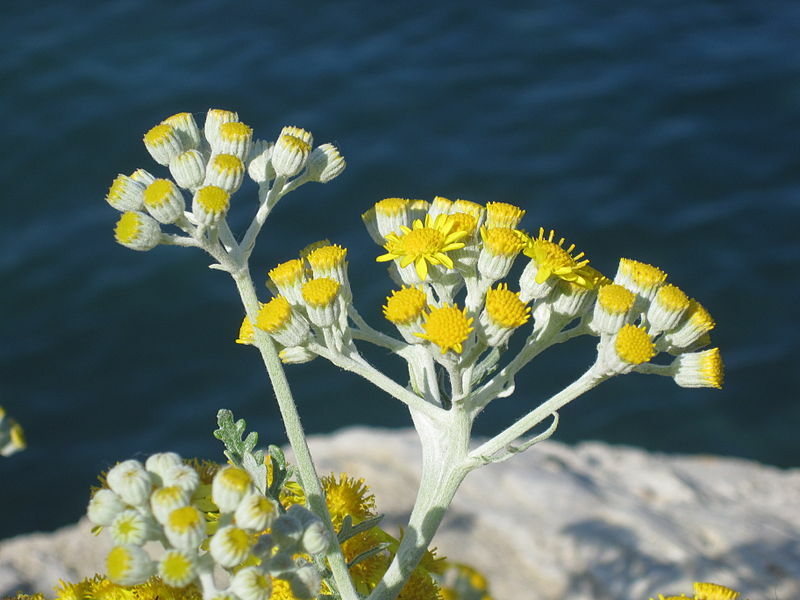 It’s a tiny, pillowy cloud of immortelle’s dryness, whether it is the dandelion and chamomile floral element, the dryness of its green stalks, or its faintly curry-like whiff. The whole thing is strongly infused with the fenugreek’s Middle Eastern dill, parsley, and leek herbal aromas, and the whole thing together combines to create a green, dry, herbal curry bouquet. The cedar lurks at the edges giving off singed smoke, but the vetiver, vanilla Bourbon, and white pepper have essentially vanished. The immortelle does change, however. At the end of the first hour, it turns spicy and even more curried, instead of merely just dry, floral, or sweet. About 2.25 hours in, Luxe Patchouli is a mere skin scent with immortelle. 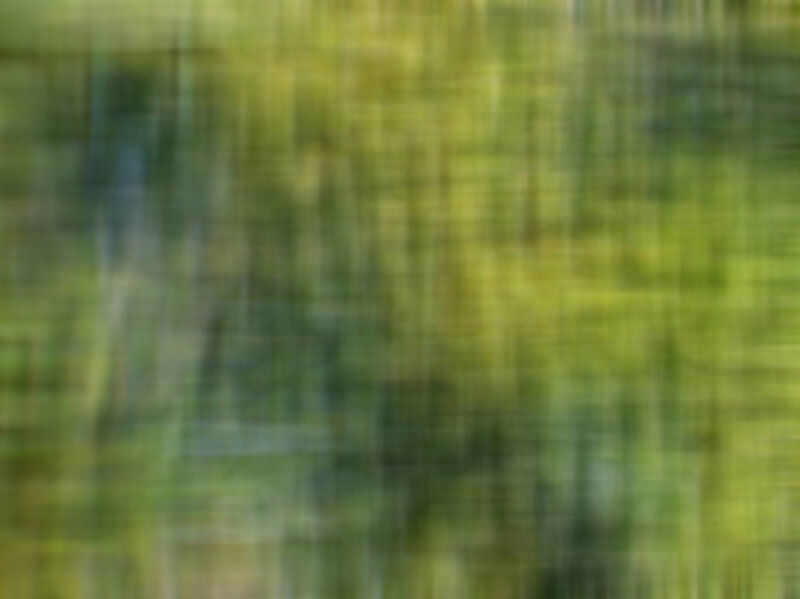 There are indistinct, tiny hints of abstract, dry woodiness and smokiness at the edges, but they are very muted. Meanwhile, the fenugreek has started to retreat to the sidelines where it will remain for a few more hours. At the start of the 5th hour, Luxe Patchouli turns more sweet, as the immortelle’s maple syrup side emerges. There is some sort of quasi “sandalwood”-like note in the base that doesn’t feel like sandalwood, per se, but a generic creamy woodiness that is lightly spiced and sweet. Frankly I don’t get much patchouli from it. All I get in this is what to me smells like angelica root. Angelica root is very powerful and tends to dominate anything it’s added to. It also smells like there is an attempt at synthetic irones as well (I have smelled some quality synthetic orris fragrance oils, and the note I get here is a close match). I loved it, but not enough to purchase a FB. It’s basically immortelle and not much else. It’s very rich and dense; almost syrupy and SL-like. It’s not that complex and I would’ve bought it…say have it been 150. I tried this at the CdG shop here and it was a memorable experience because it was the only time I have felt compelled to find somewhere nearby to wash off all traces of a scent I have sampled as quickly as possible. If this is immortelle in the raw then I can live without it. This is complex. A rich, spicy, sugary, very dark patchouli that is since the beginning smoky (sweet smoke) and with a sheer tarry and balsamic note of licorice in a link with something like anise or angelica (may be the bearberry) all surrounded by resins of oak, myrrh and vanilla. The aromatic blend ends smokey because of the influence of burnt woods from the top to the bottom but is aromatic and surprisingly green and earthy because of the influence of vetiver, bearberry and feengreek. The interaction of pepper, smoke, patchouli and tarry-aromatics (immortelle, bearberry, feengreek?) grounds a very dark appalling structure flanked by greens, hints of camphor and finally civilized and smoothed by a huge amount of balsams and resins. The fragrance itself is a tangle, the mildness is made of balsams and woods (sandalwood and cedarwood), the patchouli is well flavoured and hidden in the middle of a black bitter-sweet shadow that is aromatic and earthy, tarry and mellow at once. All the elements are in a perfect balance. Ubermodern, futuristic fragrance with a huge amount of texture in my opinion, really searched and luxurious, perfect for clubbing in all the cozy, velvety, dark-violet club of the down town. My experience was hardly as complex or as interesting. Whatever the momentary nuances of Patchouli Luxe’s opening minutes, it quickly devolved to nothing more than fenugreek dill, dill pickle, dried herbal flowers, and various manifestations of immortelle with a hint of singed cedar. If Darvant experienced all that far beyond the first 15 minutes, then I’m deeply envious. For myself and so many others, however, Luxe Patchouli was curried immortelle and little else. 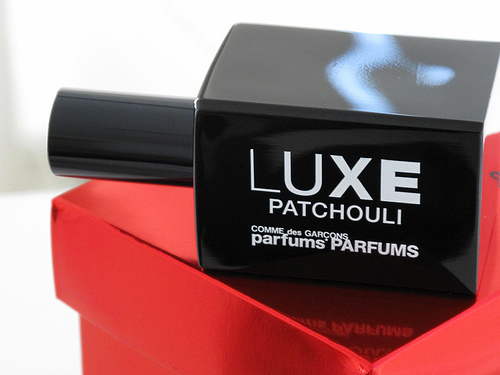 Luxe Patchouli in its box. Source: Nathan Branch. CdG Luxe Patchouli is warm, richly layered and exceptionally polished from front to finish. [¶] Whereas Le Labo’s terrific Patchouli 24 has a charred-wood quality that steers it in a darker, more unexpected direction, CdG Luxe Patchouli is nothing if not a smooth operator all the way through, definitely in the spotlight yet respectfully sharing the stage with a lush procession of incense, bourbon, dry wood, a touch of leather and a dash of salt. I’ve spent so much time on other people’s experiences to give you an idea of the positive aspects of the fragrance if you’re looking for a dry, sometimes syrupy sweet, herbal, woody scent. I’m also trying to underscore as much as possible that you will be disappointed if you’re looking for a conventional, true, dark, brown patchouli with all its traditional characteristics. This isn’t it. This is indeed an “East Asian grocery” store, followed by immortelle. 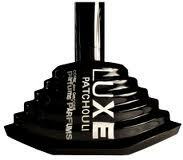 Luxe Patchouli is a nice fragrance for what it is, though greatly over-priced at $290 for a mere 45 ml. It is refined and seamless; quite unisex; and its weak sillage (but good longevity) would make it appropriate for a conservative office environment. In my opinion, however, it is not a patchouli scent by any stretch of the imagination. If there were truth in advertising requirements about perfume names, someone at Comme des Garcons’ perfume or marketing department should get their knuckles rapped. 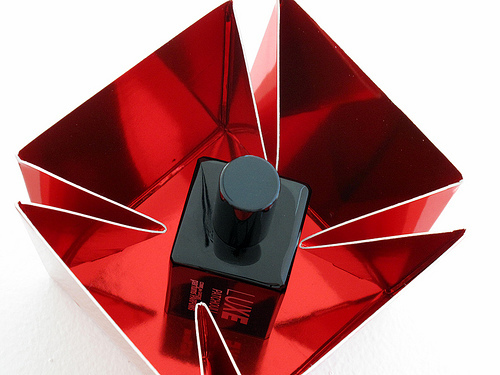 Cost & Availability: Comme des Garcons Series Luxe: Patchouli is an eau de parfum that comes in a 45 ml bottle, shaped either like a cube or like a pyramid. It costs $290 or €190. In the U.S.: you can purchase Patchouli Luxe from Luckyscent in both shapes, though the pyramid one is currently sold out. The site also offers a sample at $6. The fragrance is also available in the cube bottle from BeautyHabit for $285. Outside the U.S.: In the UK, you can Patchouli Luxe EDP at Liberty London for £95. In France, the scent is available from Premiere Avenue, Paris’ Colette, or Pur-Sens for €190. The pyramid-shaped Patchouli Luxe is offered by Germany’s First in Fragrance for €190. The regular bottle is sold in Belgium by Senteurs d’Ailleurs, though they don’t have an e-store. In Russia it’s offered by Eleven7ru. I’m having difficulty finding more stores that carry the rarer EDP version. And there is no working, functional Comme des Garcons website. Samples: I obtained Patchouli Luxe from Surrender to Chance which sells vials starting at $4.99 for a 1/2 ml.